GFG practice piece - Advice? Thread: GFG practice piece - Advice? Still have another row of black for the outer path (path?) I did the ladder stitch, but there are lots of gaps, in my opinion. Also, there were a couple times where when I did one side, and then went to sew the other side, it didnt line up exactly. I went ahead and manipulated it to work, but Im thinking it made puckers. I haven't pressed any of it since I cut it... Am I supposed it at some point?? Thanks in advance. I want to get everything right before I start on "the" big project! I have never done one so am not the one to give you advice. I think yours looks great! It looks great. A little starch and pressing should get rid of the puckers. I have a few of those sometimes too. For hexagons I did english paper piecing because the fabric folds nicely around the paper. Also I used a overcast stitch. The more stitches you make, the better it looks. I love the way the block looks. Beautiful purple! I do alot of EPP and I use smaller stitches like Recurver recommended and I also make sure I go completely into that corner and knot off before turning down the next side. The tuck might be because you didn't get the fabric completely folder around the paper smoothly. Just my thoughts. I think you can fix those spaces easily by running your needle horizontally back and forth between the vertical layers of fabric to bring the adjoining pieces exactly together. Love your colors! Did you do very tiny ladder stitching picking up one thread from each side. No matter how much you try sizes do sometimes vary. I join the ends stitch one end ind pin the other them make rest too fit. Pressing is something that was not done I was told very often because of the difficulty of warming an iron and also this was an evening occupation with husband and ironing not don at that time in many homes. looks good to me. Haven't done a GFG but still looks good! My stitches aren't very small at all. Probably only four or five per side. The ladder stitch is kind of hard for me to bet very small pieces though. Maybe I should change the stitch. I bought the pre cut paper pieces, which I love, but the fabric does seem a little 'loose' on them no matter how well I baste it. I guess thats got to be normal since its not permanently anchored to the paper.... 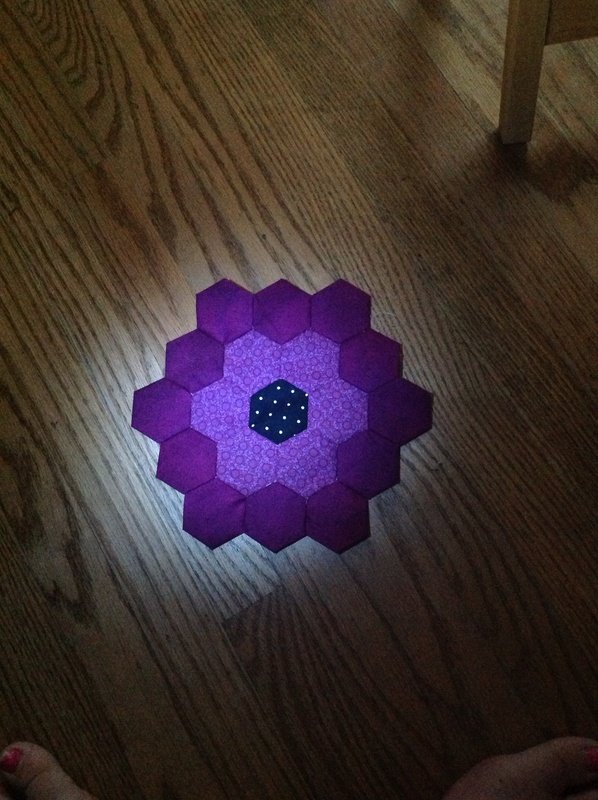 I remember on Fons and Porter on time they had done hexies and I cant remember their technique but it included somehow heavy starching and pressing each hexie. I wonder if this youtube video showing how to sew hexies by machine would help. I see that her hexies are larger but I thought I would share this with you in case you haven't see it. had the same issues so thanks for the post!! I am doing my using Inkling because EPP drives me batty. I had not seen that video before, and while it is a great video, its actually showing it on a machine vs hand piecing which is what Im doing. Thank you for taking the time to post it!!! I love it. I see nothing wrong with it. It is so pretty. I do not understand why anyone would go to the trouble of doing a ladder stitch when piecing GFG. I am with Jinny Beyer on this and simply piece with a running stitch (right sides together, from the wrong side). I do an extra back stitch towards the middle of the hex and at each end to secure the thread. Maybe it's just me, but doing a ladder stitch (I assume you are doing this from the front?) would at least double, and more likely quadruple, my stitching time! Edit: Oh, I finally realized you are using paper and doing a ladder stitch instead of a whip stitch. It's so much easier to skip the paper and simply piece like any other hand-pieced pattern! If at all possible, check your library or purchase Jinny Beyer's video or DVD on hand piecing. She shows how to piece very quickly and easily. I watched her video years ago, but I think she just came out with a new book and DVD on hand piecing. She has a separate DVD that is out-of-print and sells for something like $160 used, which is a real shame. However, check your library to find out if they have the older video or the DVD. It's much easier to watch her do what she explains than it would be to read a book about it! Last edited by Prism99; 07-03-2013 at 01:12 PM. I love the ladder stitch for some things, but not EPP, altho some people get along with it very well. When I baste the fabric to the papers, I take one basting stitch on each stright side, and of course, catching the "corners. That one basting stitch seems to stablize the fabric so it won't be so apt to loosen. I do a small overcast stitch to stitch the hex's together. I have counted, and it seems I use 10 to 12 stitchs per side on a one inch hex. The paper can be easily removed by cliping the one basting stitch from the front, turn over and pop the paper out. No need to remove the basting thread. It is pulled to the back when you pop the papers out. Also, that one basting stitch per side will keep the papers from falling out until ready to remove them. If a paper falls out, putting it back is not fun! I have been reading that some people use a glue stick to "baste" with. I have not tired that, but sounds interesting. I have been following a blog that has some nice ideas for EPP hexagons. If you're interested. This lady does some great things with hexagons. (http://www.faeriesandfibres.blogspot.ca) Good luck with your project. I'm sure you will find the "right" way that works for you. Your sample is lovely. thanks for all your advice as I am just getting ready to sew my hexagons together for my first GFG so this thread was timely! I, too, think that a good pressing will ease out the pucker. Beautiful colors and a good job. I don't use plastic hexies or paper either; I mark the sewing line as I cut them out and I don't have any trouble getting them to lie flat. Looks good to me. Will be beautiful. I am trying out a GFG block that will be appliqued in a BOM project I'm working on right now. I'm running into the same problem as the original poster. I think I know the the ladder stitch is and that's how I apply my binding by hand, so I know that stitch. I think the running stitch is what I use when I hand quilt. What is an overcast stitch? I found I didn't really care for the glue stick to adhere the paper to the fabric, but I did like using basting stitch to attach the paper to the fabric. I whip stitched a couple together and that wasn't bad. I too am trying to keep my stitch length short and that shortened some of those puckers too and I've been starching the daylights out of everything and I noticed right away the difference. Is a whip stitch like an overcast stitch?